Two Bio4Pack clients won prizes in the packaging category of the ISM trade fair held in Köln (Cologne) from 28 through 31 January. MyChipsBox.de won first prize with Bio4Pack’s biobased and compostable chips packaging, while Lovechock won third prize with biobased and compostble packaging for chocolates. Naturally, Bio4Pack is delighted about its clients’ prizes and proud to be a part of their success. MyChipsBox.de supplies chips that are produced without artificial additives and flavour enhancers and which are also sold online. The chips are made from organically grown potatoes and sold in a wide range of taste combinations such as curry/pineapple and carrot/vinegar. The packaging of the chips is just as innovative. 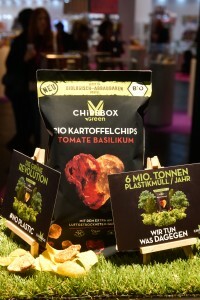 MyChipsBox.de opted for Bio4Pack’s biobased and compostable chips packaging; the solution to the waste issue caused by multi-layered chips packaging. This packaging is manufactured from raw materials that are over 80% renewable (and thus have the maximum 4-star biobased certification) and can simply be disposed of with recycled waste in the Netherlands. Lovechock produces chocolate made from organic cocoa from Ecuador. The chocolate bars are made without the use of artificial ingredients and are milk, soya and gluten-free. A product that is produced with such a love of nature naturally calls for packaging made with just as much respect for nature. Reason enough for Lovechock to opt for Bio4Pack’s (4-star) biobased and compostable packaging, which is printed by Geostick. This packaging can be disposed of with the recycled waste after use because it is also manufactured from raw materials that are over 80% renewable. Our congratulations once again to MyChipsBox.de and Lovechock for winning these wonderful and, in our view, more than justified awards. We hope the vision of these businesses for a circular economy will soon be adopted more widely.